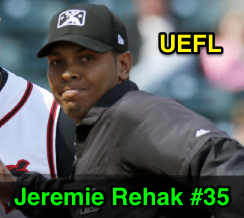 Umpire Jeremie Rehak makes his MLB debut during Monday's Mariners-Royals game in Kansas City, joining Gerry Davis' crew as the second base umpire alongside HP Umpire Mark Carlson, 1B Umpire Brian Knight, and 3B Umpire and Crew Chief Davis. Rehak takes the place of Pat Hoberg. Rehak is on the International League roster for the 2018 season, which is his third season in Triple-A. Upon graduation from the Wendelstedt School for Umpires, Rehak umpired in the Gulf Coast (2011), Appalachian ('12), Florida Instructional ('12), Midwest ('13), California ('13), Eastern ('14-'15), and Arizona Instructional ('14) leagues. He officiated the 2017 Arizona Fall League and served as second base umpire for the 2017 AFL's Championship Game, in addition to officiating the 2017 IL postseason. Related Post: 2017 AFL Roster (10/5/17). He officiated MLB Spring Training in 2017 and 2018, receiving the sleeve number assignment of 35 in April 2018. #35 was last worn by the late Wally Bell, who passed away during the 2013 postseason at the age of 48. Related Post: MLB Assigns New Fill-Ins Rehak, Visconti Sleeve Numbers (3/22/18). Rehak makes his MLB debut at the age of 30. He resides in Monroeville, Pennsylvania, is the first rookie fill-in umpire to make his debut during the 2018 regular season. His most recent MiLB game was Sunday, April 8's IL matchup between Toledo and Louisville.